In our monthly column, “Cider Loves Food,” contributor Meredith Collins (blogger extraordinaire at Along Came a Cider) is looking at different cuisines and finding the perfect ciders to help take your meals to the next level. When I need food that will warm my body and help smooth my rough edges, Italian-American food is my refuge. From a transplanted southerner, that may sound strange, but I assure you it works. Here, in upstate New York, it’s easy to find Italian-American classics at restaurants, and many of them are also simple to make at home. For these pairings, I’m steering towards home cooking rather than restaurant fare, with an eye on variety. I could be happy just pairing pasta with cider every day for a month, but there are so many more different possibilities! As I’ve said in my earlier pairing columns, I’m not an expert on all of the cuisines I pair with cider. I’m just a fan. What I bring to the endeavor is my familiarity with the cider world, and I’m happy to pair cider adventurously! And, If I’m getting it all wrong, teach me (kindly, please) in the comments. I want to learn more! Part of what makes this dish appealing is the serious amount of sauteed garlic that goes into it. And since you can serve this as either a side dish or a soup (depending on how much of the broth you remove or keep in), it’s very flexible and flavorful. You can also let it rest and serve it room temperature or dish it up right off the heat. I like to pair this with an off-dry to semi-dry sparkling cider, like the Aragon 1904 by Blue Bee Cider. Or if you want something drier, Big Hill Ciderworks Manchurian. I like a touch of sweetness and bubbles to break through the savory cheese and pungent garlic. 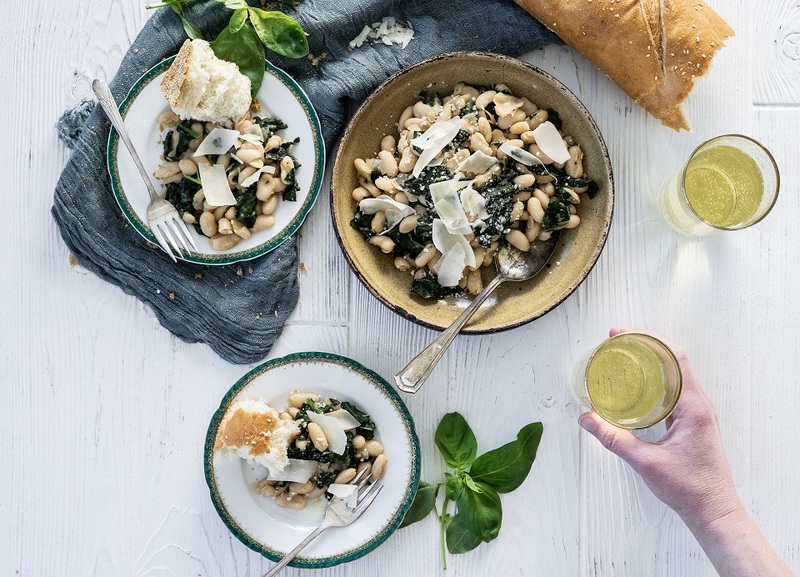 Both of these ciders have enough acidity, whether from heritage apple varieties, as with the Blue Bee, or from crab apples from Big Hill, to enliven this beans and greens combo. I want a cider with heft for any soup involving tomatoes, so I first thought of Colorado Cider Company’s Ole Stumpy with plenty of barrel characteristics. However, that’s not the only direction you take when pairing cider with ribollita, a hearty peasant dish of bread-studded vegetable soup. The rounded sweetness of a semi-dry cider, redolent with heritage apple aromas, can also add some pleasing body. From that angle, I recommend the Heirloom by Champlain Orchard Cidery. 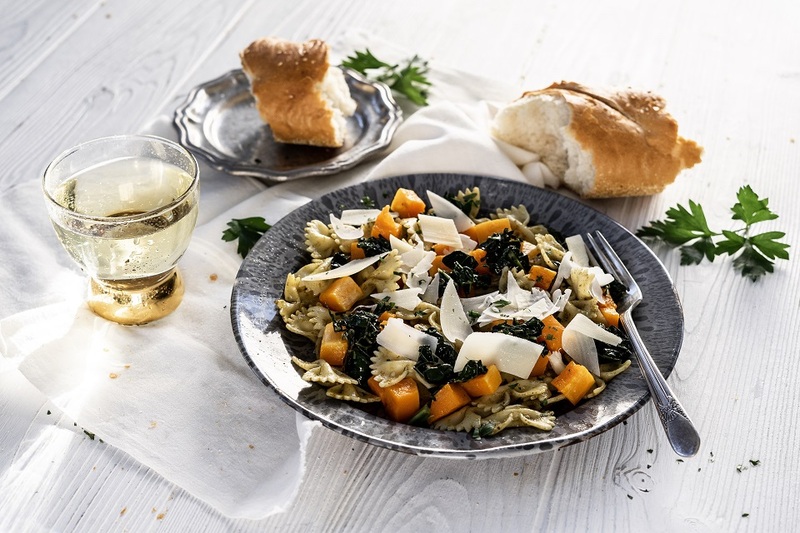 This hearty recipe is a little less traditional than some pasta dishes, but it’s too good to pass by. I started making the Mark Bittman version years ago, and, with some of my own variations thrown in the mix, it’s a recipe I now know by heart. Try Bittman’s to start, and modify it to your liking! I enjoy this with a dry, yet fruity, super-bubbly cider like Castle Hill’s Serendipity 2015 or Redbyrd Orchard Cider Cloudsplitter 17. When the main vegetables in a dish are dense, like kale or squash, I want mega-intense effervescence, which helps to play with contrasting textures. If you’ve never made a pan sauce, they are so much simpler than you might assume, based on the complexity of the finished product. The key for the pairing with sauteed zucchini and shrimp in a cider or perry garlic sauce is to create the sauce with the beverage you’ll be pairing it with. 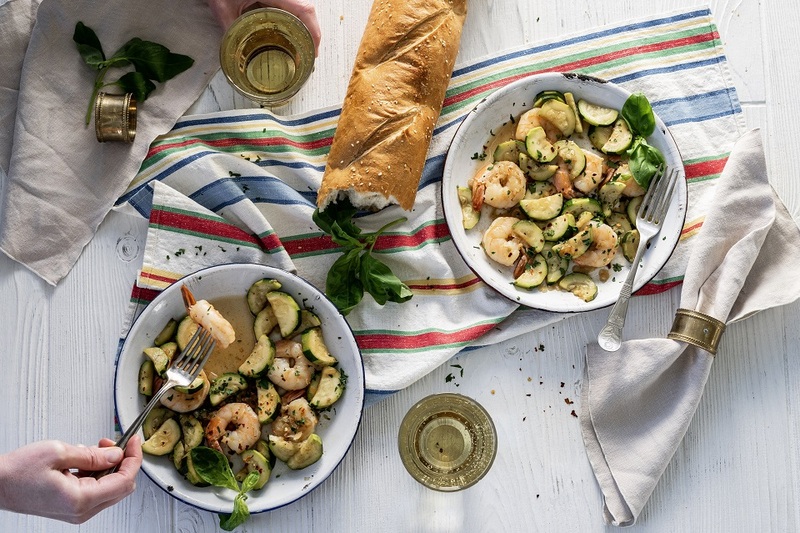 I like using zucchini and shrimp because both of those flavors are relatively delicate; they aren’t overpowering for a lighter cider. My recommendations for cider pairings are Vander Mill’s Bon Chretien (a perry that gets along very well with shrimp) or Descendant Cider Company’s Descendant Dry. The perry works because it’s so aromatic and light; it enhances the zucchini and shrimp gently. The Descendant Dry is a more zesty and acid-driven choice; ethereal enough to work, but the pointed acid makes this cider pairing maximally exciting. I love Big Fish Cider’s Monterey Maple, with its layers of flavor from both apples and the apple brandy barrels and maple syrup used for fermentation. I like the simplicity of polenta or pasta with such abundance of flavor. Making a pork and mushroom ragu doesn’t have to be difficult, but it looks impressive, particularly over polenta. Another fantastic possibility is Rootstock Ciderworks’ Barrel-Aged Legend, which leverages barrel characteristics perfect for the body and natural sweetness of this pork and mushroom dish. Alrightly, here’s where the American classics element of Italian-American comes in. This is American comfort food, made Italian style. Steam or roast a few heads of broccoli with olive oil. Saute some ground sausage (or meatless sausage for the veggie folks) with your preferred blend of spices. Cook any stuffed pasta shape like ziti or shells until al dente. Then combine all of the above with a marinara sauce and put them into a casserole dish. Top with a blend of mozzarella, provolone and Parmesan, and bake just long enough to get everything bubbly-hot. With this sort of recipe-free casserole, your pairing possibilities depend a lot on what you choose to put in it. I like to use Field Roast Italian Sausages, which are heavy on the fennel aroma. That makes my cider choice easy: something hearty with a big mouthfeel. I think the Porter’s Perfection SV from Liberty Ciderworks would be amazing. The cider is dry, still and tannic with lots and lots of body. For familiarity, you can’t beat simple, easy spaghetti and meatballs. Sure, people may argue about what goes into a proper tomato gravy, and whether the meat in the meatballs should be beef, pork or a blend of the two (or Quorn Meatless Meatballs). Whatever you put into your meatballs, try pairing this dish with a cider that’s elegant, dry and still. I adore South Hill Cider’s 2015 Pomme Sur Lie. The cider is structured, savory … even nutty. This can take a homey favorite and elevate it into something more. You might be familiar with cannoli and tiramisu; these are the A-List stars of Italian-American desserts, and they pair very well with dessert ciders. I don’t want to live on the tip of the iceberg though. Custard variations are a wonderful branch of desserts to explore with cider. Try your hand at an ice cider panna cotta (a firm custard made with gelatin), using an intensely flavorful ice cider to flavor the custard. Eden Specialty Ciders produce several winning possibilities, but the Heirloom Blend Ice Cider is especially balanced for this dish. Or, try a butterscotch or caramel budino. Budino is a pudding rather than a molded gelatin dessert, but has a creamy freshness similar to panna cotta. With this dessert, power up the flavor and warmth with a pommeau. Black Diamond Cider makes Porter’s Pommeau with cider-specific bittersweet apples, and it’s exceedingly luxurious on its own. Pairing this pommeau with a caramel-laced, creamy dessert is my favorite kind of over-the-top treat. Savor the possibilities for pairing Italian or Italian-American food with cider. Try what I suggest, or do a little searching on your own. Cook or find a restaurant you like with a decent BYOB policy. There’s a dizzying range of possibilities, and cider enhances them in ways that only enhance their best features. Looking for more ways to pair cider with food? Check out Meredith’s other Cider Loves Food stories about cider and Thai food, cider and sushi and Japanese food, cider and CSA veggies, cider and brunch and cider and tacos and Mexican food! My mouth is watering and stomach growling ??? ?